The new year is finally upon us, and with it comes a slew of resolutions and promises. Is this the year you lose weight, get your finances in order, or vow to see your friends and family more often? Perhaps your resolution ought to be playing more fun games – that’s a classic, and it never gets old. To that end, we’d like to introduce Poki. 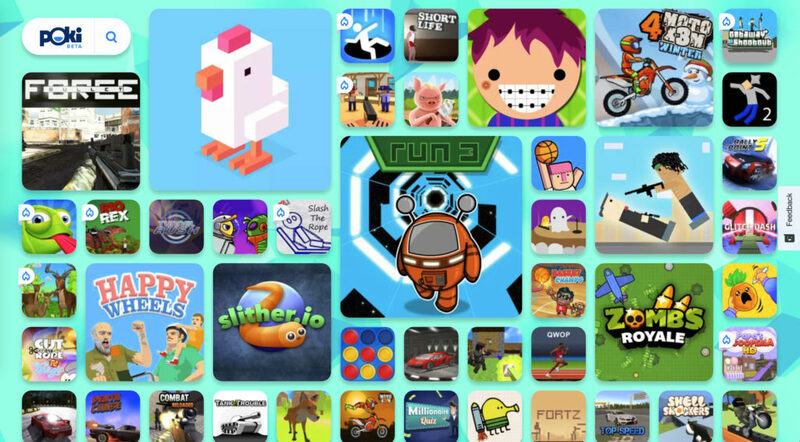 Poki bills itself as an “online playground” for gaming, and it’s a pretty accurate term; everything from shooters to motocross games to puzzlers can be found here, and it’s a pretty solid place to start honoring that “have more fun” resolution. Here, without further ado and in no particular order, are the top 10 trendy games you can play on Poki this January. We open proceedings with whirligig multiplayer shooter Getaway Shootout. If you’ve ever envisioned yourself fleeing the scene of a botched bank robbery, betraying your friends as you race to be the first to reach the getaway vehicle, then here is the oddly specific fulfilment of that vision. Each session of Getaway Shootout sees four characters competing to reach the finish line, aided by whatever weapons, shields and other assistance they can collect along the way. 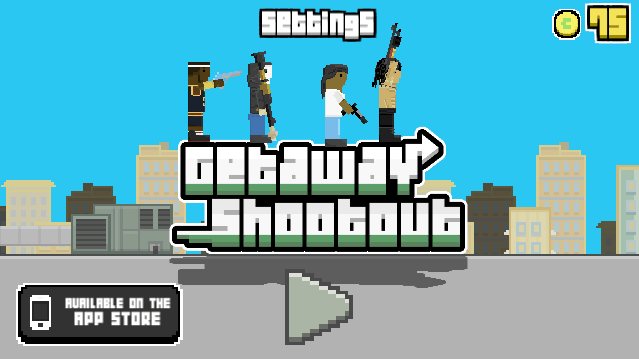 Getaway Shootout boasts an intriguing jump-based control scheme that’s both hilarious and surprisingly skill-centered, while its array of powerups and bonuses make each multiplayer session a joy. Get some friends round for this one and watch the sparks fly. There is a single-player mode for those who don’t find themselves in a social mood, but it definitely takes a back seat to the madcap, frenetic antics of the multiplayer. This one’s great for solo players and multiplayer fanatics. 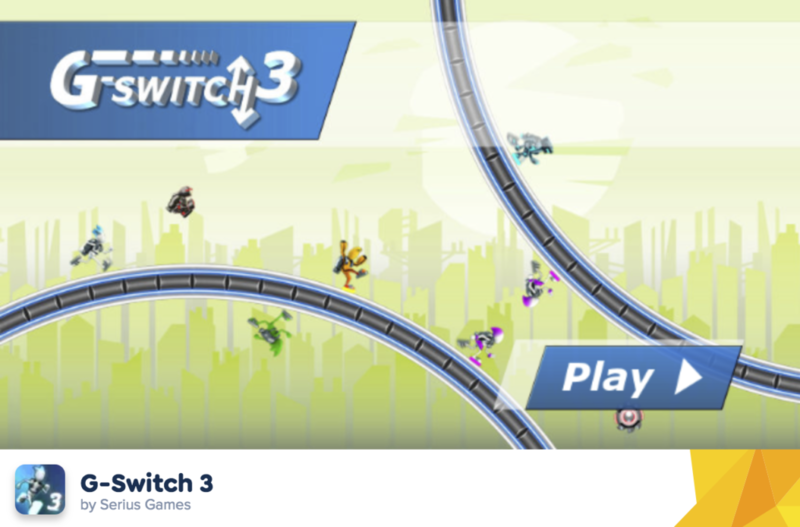 G-Switch 3 is a super fun game, a platformer with light puzzle elements that sees players navigating mindbending mazes made up of walls, floors and death traps. G-Switch 3’s only mode of control, and its only system of movement, is the ability to instantly change the protagonist’s center of gravity. In one moment, you’ll be running along the floor just like a regular human being would, but with a quick flick of a single key you’ll suddenly transition to sprinting along the ceiling. G-Switch 3’s varied, interesting levels are all built around this mechanic; technically, the game is endless with invisible level transitions, but there are distinct stages here. Once the solo fun ends, there’s also a multiplayer mode that allows up to 8 players to engage in the hilarious racing action. Those of you who are regular smartphone players will know this portable staple, but we’d strongly recommend you play it on Poki rather than limiting your experience to a tiny phone screen. Crossy Road’s blocky, cubist visuals are best enjoyed on a larger display, not least because knowing where you are and what you’re doing at all times is crucial to this modern update of classic arcade road-crosser Frogger. In Crossy Road, the objective is, shockingly, to cross a series of procedurally-generated roads. Unlike G-Switch 3, which merely has the veneer of being endless, Crossy Road only stops when you die. Along the way, you’ll collect coins, which can be used to unlock new characters using a gatcha-style arcade machine system. For January, they’ve also introduced a new, out of this world, space edition. 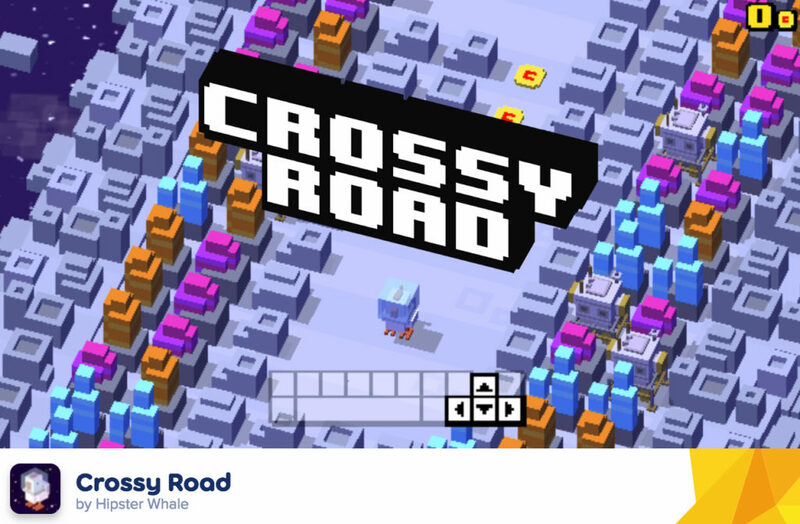 If you’re not au fait with the addictive magic of Crossy Road, start here. Has the Christmas and New Year period left you with some steam to blow off? If so, perhaps you’d be interested in mutilating a doll to work off some latent aggression? 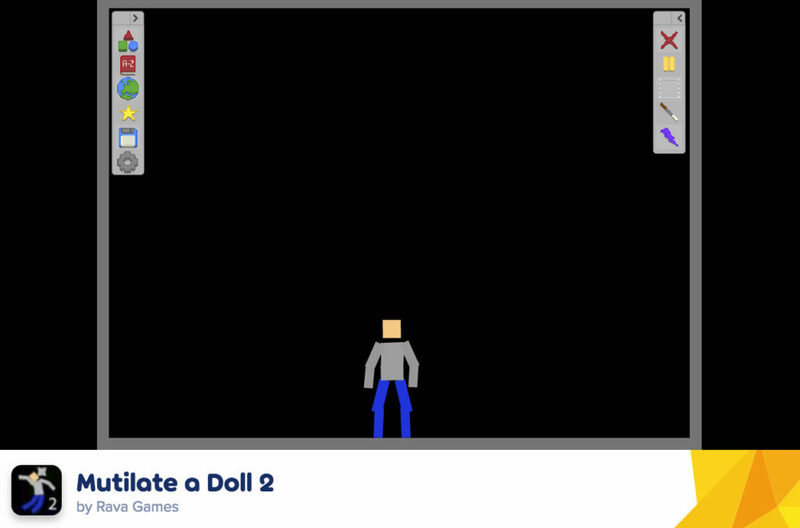 Mutilate a Doll is one of those games with a perfectly descriptive name, as it’s essentially a series of increasingly elaborate and violent ways to pull apart the titular ragdoll figure. 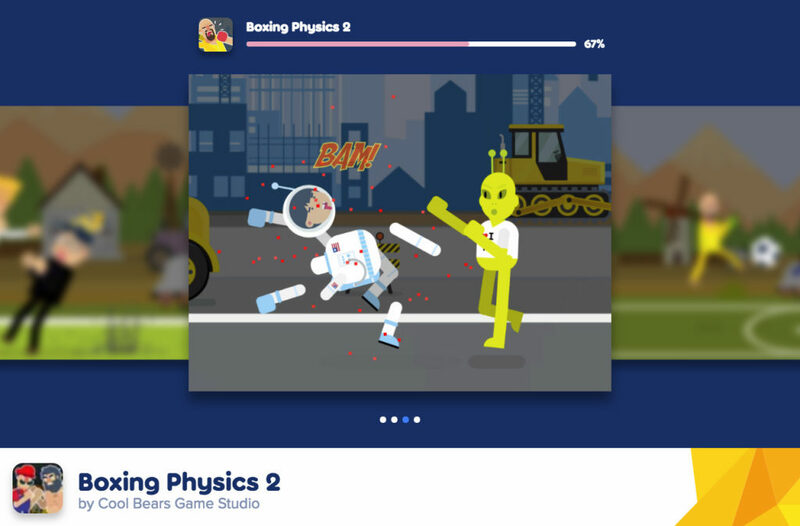 Of course, this isn’t just about catharsis; there’s a surprisingly full-featured physics sandbox included here which doesn’t just offer options to tear up toys. We won’t spoil the full extent of what’s on offer in Mutilate a Doll, but suffice it to say that even if you’re the world’s calmest person you’ll find something to love here. Mutilate a Doll is a fun, light-hearted and silly exploration of comic violence that those with a particular grudge against something or someone will love. 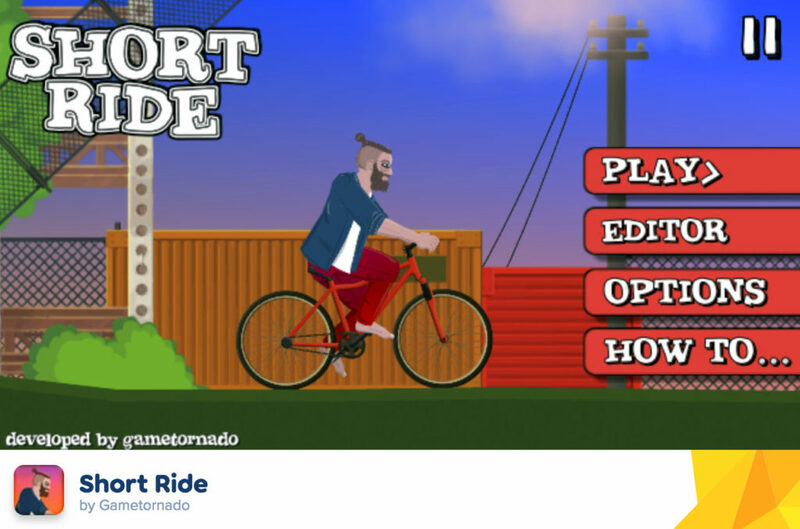 Again, the title of Short Ride is appropriate, since this fun little cycling game is very likely to end early for most first-time players. This physics-based cycling platformer is a sequel to Gametornado’s Short Life, which took a similar daredevil approach to the life of its protagonist. Short Ride is a sort of physics platformer-come-racer in which your rider (who can be customized by collecting the in-stage stars) must race past a series of increasingly dangerous hazards in a bid to reach the finish of each stage. The trick here is in the controls; Short Ride asks players to familiarize themselves with its push-me-pull-you control scheme before they’ll be proficient at the game. It’s great fun to play, and it carries with it a remarkable sense of satisfaction when you’re victorious. If you’re looking for fun .io games then look no further than this curiously nihilistic title. Hole.io, like many of its stablemates in the .io genre, represents the multiplayer gaming experience boiled down to its absolute basics: eat other players if you’re big enough, retreat from them if you’re not. You play as a hole in the ground – a novel concept in itself – and your job is to swallow ordinary outdoors objects like lamps, cars and garbage cans, as well as other players’ holes (best not to think about how that works in physics terms) in order to grow bigger. 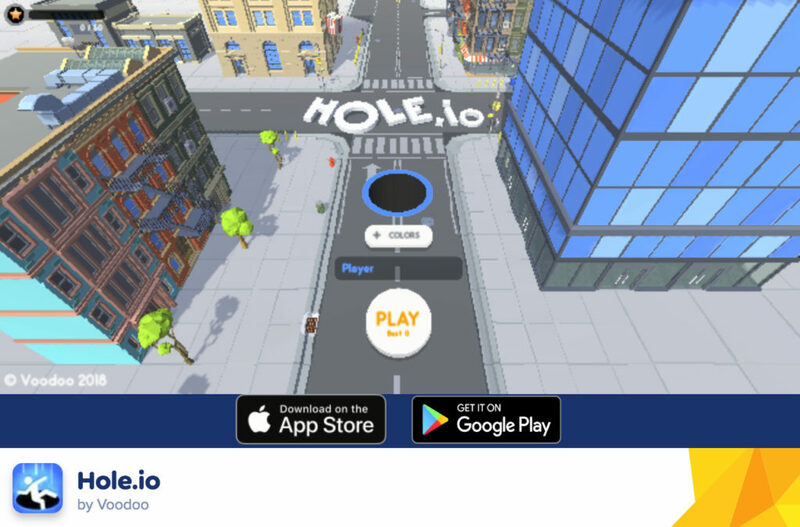 Hole.io boasts beautiful 3D visuals, a ridiculously compelling central gameplay loop and short enough game sessions that jumping into “just one more” is never a bad idea. Stick figures get a bad rap, but they’re insanely useful. They’re used on movie storyboards to show action in a rudimentary way, they’re a great start to drawing a flipbook, and they’re apparently dab hands with grappling hooks – or at the very least the protagonist of Stickman Hook is. 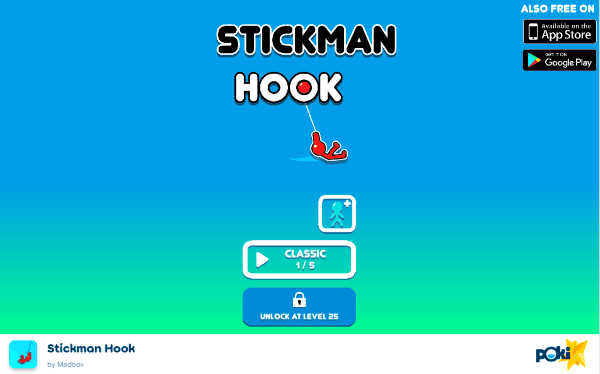 Fans of games like Bionic Commando and Spider-Man should apply here, as Stickman Hook is a 2D physics grappling platformer in which players must leap from hook to hook, using their momentum to carry them towards the finish line. There’s a huge amount of levels on offer here, and the Poki-exclusive web build is (whisper it) superior to the mobile version thanks to its beautiful animations. French studio Madbox have really outdone themselves with this one. Feeling the need to unwind after a long day, but don’t want anything patronizing? 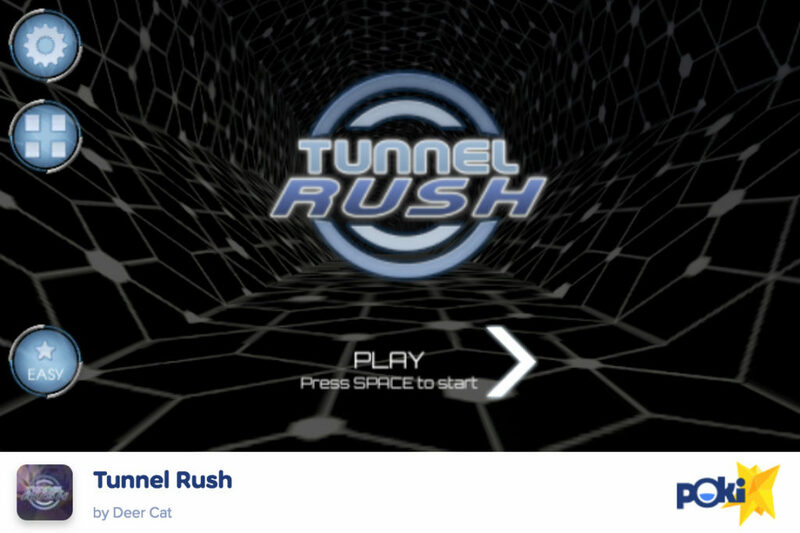 Tunnel Rush is a first-person auto-runner in which the only two objectives are to reach the end of the stage and avoid any obstacles along the way. Of course, there’s more to it than that: obstacles start out fairly basic, but it won’t be long before you’re sprinting through dizzying mazes of interlocking switches and moving parts, desperately hoping you can reach the end unscathed. Tunnel Rush is respectful of your time, though, so you’ll never lose more than a stage’s worth of progress if you die. The experience is quite bare-bones, but that’s what we love about it; Tunnel Rush doesn’t pretend towards being some sort of transcendent experience, and is content to be a really good game about dodging big blocks in a tunnel. In the grand tradition of games about people beating each other up, Boxing Physics 2 claims the rather unique position of being simultaneously hilarious and incredibly compelling, and a really fun game into the bargain. In this physics-based fighter, players compete to be the victor in a series of violent battles, some of which are points-based and some of which revolve around health bars. There are single-player and multiplayer modes, and there’s a whole host of extra rule sets that add all kinds of quirky extra stipulations to gameplay. How about a bout in which players go down in one hit? What about littering the stage with deadly traps? Throw in a host of unlockable characters and extras and you’re looking at a bona fide multiplayer smash hit (no pun intended). This adorable ghost game continues the minigame-centric action of developer Ohmaigawd’s previous game Life – The Game. 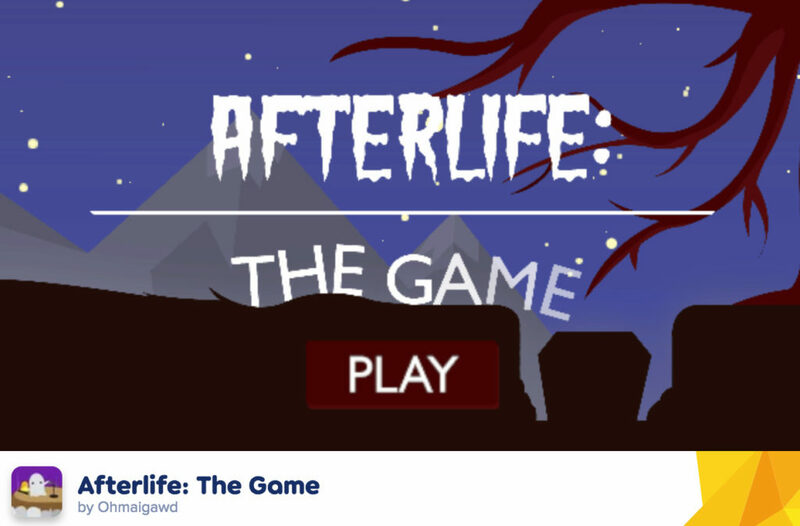 In Afterlife, you control the titular ghost and must complete a series of varied obstacles. In one game, you might be simply guiding the ghost towards the light, while in another you’ll be possessing the spirit of a terrified teen as he plays today’s jump scare fodder video game. The whole experience is presented with a cute, endearing aesthetic that reminded us of indie point-and-click Stick It To The Man, and there’s a real variety on display here that means no two minigames ever feel the same. If you like ghosts, games that defy genre and protecting old ladies from flying poop, then your tastes are covered by Afterlife.